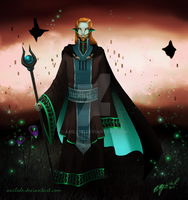 Some of you know me because I used to draw Ganondorf all the time. I thought yesterday, why not draw him? It's been a while! XD So I sketched him up and did a speed-paint. Not in one sitting, mind you, but all in all it took about 4-5 hours I think! I painted up from a black canvas instead of white. Wow if you wanted to give a very intimidating look and feel on this, you totally succeeded. 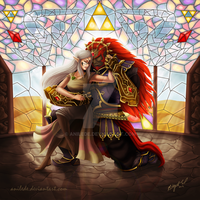 This pic is gorgeous, we never have enough HW Ganondorf, he's really awesome in your style! Great work! Exactly! I feel like they took all the best parts and put them in this design. I wish Nintendo showed us what Ganondorf would have looked like in Breath of the Wild though! 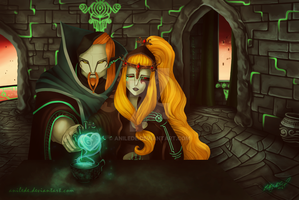 Hey have you read the web comic "A Tale of Two Rulers", the way the artist draws Ganondorf is mind blowing. Recommend! Incredible reference material. Yep! XD That feels like so long ago now lol! I've read "A Tale of Two Rulers". For some obvious reason, Ganondorf looks as though he's drawn by Glen Keane, a famous Disney animator who did the Beast for Beauty and the Beast. Wouldn't you agree with on that?